Johnny Depp gives another brilliant performance in a film by Tim Burton. He’s one of my all-time favourite actors because he plays such unconventional and quirky characters. His role as Barnabas Collins in Dark Shadows definitely fits into that trend. 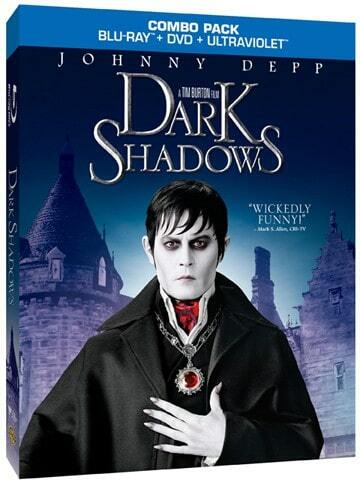 I would consider Dark Shadows a dark comedy because it was so funny! Johnny Depp was hilarious as a vampire returning to life in the future after being stuck underground in a coffin for 200 years. Even in the 1970s when the movie is set, things are MUCH different. I laughed so hard the first time Barnabas saw a set of car headlights. I think that was my favourite line in the movie because it had both John and I in stitches. There is some violence when Barnabas needs to feed. Remember he’s a vampire and is very thirsty after not drinking for almost 200 years. He kills all the construction workers who found him and later another group of “unshaven young people”. His words. That part was even a bit funny though and despite having to kill them to live, he still remains a likable character. There’s also a bit of a love triangle. Baranabas falls head over heels with the young nanny staying in his family’s mansion. However, Angie (aka Angelique), a witch and his arch-nemesis who buried him for 200 years, is still around and causing trouble for the Collins family with her rival canning business. I did not like Angie at all and wanted to see her fail and the Collins’ family win. I also really enjoyed the movie being set in the 70s with all the 70s music, hairstyles, heavy makeup and clothing. Dark Shadows is a movie I would watch again for a good laugh! I really want to see this! I love Helena Bonham Carter in anything! I do miss the old tv series Dark Shadows though, I remember being afraid that Barnabas was going to bight my neck at night whe I went to bed, so I would cover up my neck and then TRY to go to sleep! Thanks for the review!!! I remember when they made a Dark Shadows tv series 20 or so years ago and I would never miss it. Absolutely loved Barnabas Collins ~ never knew I’d grow up and marry a Collins (thank goodness mine is not a vampire). I would like to see the modern, comical version of an old classic! This movie looks like so much fun! I have this movie and I can not wait to see it! I will wait to see it on Halloween. I like Johnny Depp in so many movies, and I am sure I will like him in this movie!